Convert your existing fixtures into efficient and cool running LED fixtures simply by changing the bulb. Imtra LED replacement bulbs incorporate PWM constant-current drive electronics promising long-term performance and reliability even under variable voltage conditions. Several variations available for most socket types. 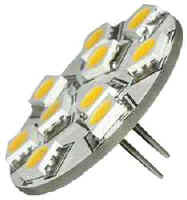 Most are offered with warm white light that is consistent with traditional bulbs. Cool white, red and blue are available on some models as well. Safe, cool, reliable and energy efficient. Featuring 10 high output thermally-efficient SMDs, “X-Beam” delivers record setting output in a G4 form factor. The side entry model fits many popular ceiling dome lights. The back entry model, supplied with extra long pins, is ideal for bell shaped reading lights or downlights containing vertically hung G4 bulbs. Simply snip the pins to desired length.